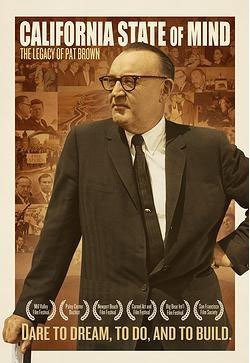 This Emmy nominated documentary is an exciting tale of the West, an entertaining biography and a provocative portrait of a man whose bi-partisan can-do optimism inspires students today. In the turbulent 1960s, an ordinary man rose to face extraordinary challenges and powerfully shaped the future of modern California. A dynamic American dream story unfolds in this new film on Governor Edmund G. “Pat” Brown — “the Godfather of Modern California.” Told through the eyes of Brown’s granddaughter, award winning filmmaker Sascha Rice, this film gives students an inside look at a California icon and a political family, called by some “the West Coast Kennedys.” As the filmmaker investigates her grandfather’s legacy, viewers are invited along to assess Brown’s policies, look critically at issues of government, leadership, civil rights, growth, and the clash between environment and economic development. Brown’s career intersects with such luminaries as JFK, Nixon, Reagan, Cesar Chavez, and Martin Luther King. Transporting archival footage is interwoven with revealing commentaries from former Governors Arnold Schwarzenegger, Pete Wilson, Gray Davis and current Governor Jerry Brown as well as Democratic Leader Nancy Pelosi, Congresswoman Karen Bass, and Senator Dianne Feinstein. Categories: Uncategorized | Tags: documentary, Governor Edmund G. "Pat" Brown | Permalink. The first dinner seminar of the 2014-2015 academic year will feature Lincoln Cushing, author, archivist, and activist speaking on socially conscious printshops in the Bay Area. Author of a book on social justice posters in the region, Cushing will discuss the shops that produced these powerful works of art. The session is from 7-9 p.m. at the UC Berkeley Institute for Labor Research and Education, 2521 Channing Way, just east of Telegraph Ave. Contact Myra Armstrong, zulu2@berkeley.edu, 510-643-3012.